Distributing information online has never been easier. But with technology comes new challenges, such as protecting your premium content or confidential information. 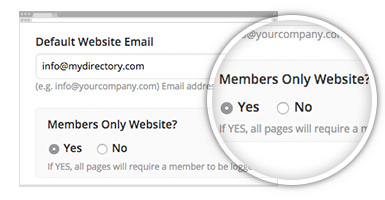 This add-on gives you full control over who can access your website’s content by requiring designated “members” to log in before being able to view your premium and protected content. The Members-Only Content add-on is a great add-on for anyone who wants to restrict content accessibility on their directory website. QUESTION 1: Do you want to build a website entirely for registered users and block public access to all of its content? QUESTION 2: Do you want to limit access to only certain types of content on your directory website? QUESTION 3: Do you want to limit content accessibility to certain types of registered members? QUESTION 4: Do you want to encourage member account upgrades by placing specific content behind a virtual paywall?